No part of this publication may be copied, reproduced in any format, by any means, electronic or otherwise, without prior consent from the copyright owner and publisher of this book. This is a work of fiction. All characters, names, places and events are used fictitiously. The tension was very strong in the board room as everyone waited for Matthew Davenport to arrive. The Chairman didn’t want to get started with the meeting without Matt. One board member was tapping his ink pen on the table. Another was shaking her foot in dreaded anticipation. Some were whispering. Many bore serious expressions. Some had scowls on their brows, and their lips were tight in a straight line. Matthew was running late, as usual. Today wasn’t a good day to be running late. He made another mark against himself without even knowing. Matthew was a laid-back person, but if he knew a decision had been made that would alter his life, he’d have put more effort into being on time and pleading his case. The board members were getting angry as they could hear the clicking of the clock and realized that Matthew didn’t find this meeting important enough to be punctual. Of course, the members felt their time was of the utmost importance. Finally, twenty minutes after the hour, Matthew moseyed into the room. All eyes looked at him. Some were angry. Some wanted to deliver the bad news and get out of there. Matthew innocently sat down, opened his notepad and waited for the meeting to start. “It’s about time you joined us,” Mr. Davenport said with contained anger. “Dad, I’m just a few minutes late,” Matthew said, looking at his father. Matthew strongly resembled his father, Alexander Davenport. Both had piercing green eyes, auburn hair and a strong jawline. Mr. Davenport’s hair was graying, but he looked very distinguished and was aging well. “We’ve had a matter of concern that the board has been discussing. Since I’m the Chairman, it’s my responsibility to deliver the news to you,” began a weary Mr. Davenport. “What are you talking about?” Matthew asked, confused. “Didn’t we ask you not to film the documentary about the increasing gap between the rich and the poor?” asked Mr. Davenport with a glare. “Yes, but if it helps our company to be more humanitarian, then I think it was a beneficial idea for all involved,” Matthew answered in a smug way. “I didn’t mean to cause a problem. I wanted to make a movie that I feel deeply about. I think our company needs to help those in need. We have so much, and they need so much,” explained Matthew, humbly. “What? You’re not serious!” Matthew said, feeling a sense of dread. Matthew took a look at the others sitting around the table. Some were staring back at him with a fierce look in their eyes. Some wouldn’t even meet his gaze. Matthew was trying to understand how a simple documentary could cause this much trouble. “It’s too late for sorry,” an older, balding man interjected. The members gathered their items and proceeded out the door, mumbling and talking amongst themselves. With the room empty and his father not speaking, Matthew was getting really nervous. He felt more was coming from his father, and it wasn’t going to be good. “You’d disinherit me because of a movie?” asked Matthew, with shock filling his entire body. “Loyal to you? You’re not loyal to me! Obviously, your money and cosmetic companies have more of your interest than I do. How can you do this to your son?” Matthew asked. He’d never seen his father this angry before. “I don’t have a son anymore!” Mr. Davenport said, with coldness in his voice. “How do you expect me to live on the money you’re giving me?” Matt wondered if he could make it on this small amount. “It’s nice to see where your priorities are. You’re a despicable human being,” Matthew said, as he grabbed his notebook and walked calmly out the door. Matt walked into the house still in disbelief over his father’s decision to disown him and cut him off from his inheritance which would have been three billion dollars. Matt sat on the couch looking over this home that was a miniature castle. He noticed the expensive vases, portraits, oriental carpets and the fresh flowers his mother had delivered every day. Even though he was given a million dollars, it was so much less than his inheritance would have been. He felt like he was destitute. Matt was trying to decide the best way to discuss this with his father. “Oh, you’re home. Did you attend the meeting with your father?” Monica Davenport asked cautiously. “Yes, I attended the meeting. I’m aware that you know what was being discussed,” Matt declared, as he walked directly in front of her. “Yes, I know what was being discussed,” Monica said, standing up taller. She straightened her strawberry blond hair. Her hazel eyes looked cold and calculating, as she looked into her son’s face. “Mom, I don’t think I did something so bad that you both had to disown me and take away my money. Isn’t this something we can talk about and work on a compromise?” said Matt, trying hard to not sound to desperate. “Your father and I feel very betrayed by you. We feel that you’re the enemy. Making that movie showed that you don’t care for us or our work. You’ve upset many people. It’s best to leave and live the life that you create for yourself,” Monica said with no emotions. “You did this to yourself. You need to make a plan of where you’re going to go,” Monica said, walking away. Matt headed up to his room and plopped on the bed. He didn’t know where to begin. He grabbed the family photo that was on table next to his bed. Matt noticed how much he looked like his dad, with his auburn, curly hair and green eyes. He was a little over weight and was sure his mom wasn’t thrilled with that. This entire situation felt surreal to him. As he was going over today’s conversations, he started to feel angry and misunderstood. He suddenly felt his cell phone vibrate. “Hey, what’s up?” Matt asked, trying to sound normal. “I booked a suite for the LA Lakers game tonight. Do you want to meet us there?” asked Rob Buchanan, one of Matt’s billionaire friends. “I’m not sure,” admitted Matt. “What do you mean? All the guys are going to be there. You never miss stuff like this. It starts at 7:00 p.m., and you better be there,” laughed Rob. Matt sat up on his bed, leaned back on the wall and tried to figure out where he should live. It might be a good time for a fresh start in another city. What would he do for work? Maybe there’d be a TV station that had a job opening. After a while, he decided to get ready for the ball game. His brain hurt from thinking so hard. Maybe taking a break would help him refocus on a solution to this problem. Matt walked into the suite and stood in the doorway watching his friends as they watched the game. These four friends, who all grew up together in Rolling Hills, California, were like brothers to him. Ben Stansfield was a billionaire from old money. His great-grandfather had been in real estate, and Ben specialized in buying and selling luxurious homes and high-rise towers, and now he was getting into the construction side of projects. Jon Winchester’s family had been involved with the chemical industry, ever since plastics were invented. He was a billionaire because of them. Rob Buchanan was a friend from high school. His parents worked for Jon’s family. Rob was a self-made billionaire. He started two social-media sights, and then reinvested the profits into other markets. He didn’t want to have all his profits coming from one type of business, so he diversified. Chris Avery took his dad’s million-dollar hotel business and grew it into a billion-dollar business. How could Matt tell them what happened today? He walked over to the food bar and dished up some food. “Matt, you made it,” Rob said, slapping Matt on his back. “Yeah, what’s the score?” asked Matt. “Lakers twenty-two, Utah Jazz twelve. I’m glad you finally got here,” grinned Rob with a gleam in his brown eyes. They both walked to the seats. Matt said “hi” to all the guys, and then started watching the game. Basketball usually was a great distraction from what he thought were big problems. But today, Matt wasn’t paying attention to the game. He found himself watching the crowd. He wondered what they did for work, and how they paid for things. Matt felt penniless even though he knew that wasn’t true. He interviewed people for his movie who were very poor, and they still seemed so happy. He was scared and unsure of everything. “It was halftime and the men left their seats and came to get some food inside the suite. “Do you guys think you could live your life as a regular person?” Matt asked to no one in particular. All four men stopped getting their food and looked at him. “What are you talking about?” Ben asked, running his fingers through his dark blonde hair. “Did something happen?” asked Jon, whose usual playful expression turned serious. “No, no, no. Nothing happened. I was just watching the crowd, and I was wondering if we’d be able to live like they do,” chuckled Matt, trying to appear easy-going. “Of course, I could do it. I’ve lived a normal life before my online businesses took off. I know I could do it, and while I’m living the normal life, I know that I could start another billion-dollar business. It wouldn’t be tough for me,” said Rob, sounding confident. “Why would anyone want to live like that if they don’t have to,” Jon said, sounding shocked. Matt grinned like a Cheshire cat. “You’ve got something planned,” accused Chris. 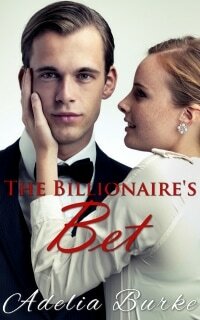 “Just a small wager for those who want to bet,” Matt smiled. “What kind of a bet?” asked Ben. “I want to see how many of us could live on the paycheck of a regular job for a year,” Matt said, holding his breath and waiting for a response. “Why would we do that?” Jon asked in disgust, his blue eyes looking confused. “It’s just for the challenge,” replied Matt. “Are you serious? Why would you want to be like them, when you can be like us,” laughed Chris, flexing his muscle. “Yeah, I’m serious. This could be fun. We’d all get regular jobs and live on that income. We could try it for twelve months. The prize for the winner would be a thousand dollars,” said Matt, trying to plant the seed. “It’s not worth it for only a thousand bucks,” Rob informed them. “I wouldn’t want to do it for a year. What about six months?” countered Ben. “Are you really going to doing this?” questioned Jon. “I like challenges, but a year’s too long,” answered Ben. “The game’s going to start. Let’s get back to our seats,” Chris suggested. Matt sat staring at the game, but his mind was on this bet. If the guys went in on this, it would solve two problems. One, he wouldn’t have to tell them that he was cut off from his family and money, and, next he’d still have his friends with him for a year, and then, he wouldn’t have to be alone as he tried to figure out his future. Pulling the guys into his misery was the best answer of all. If he didn’t have his family, at least he had his friends. The guys were so happy that LA beat the Jazz 127 to 121. It was a close, action-packed game. They weren’t in a hurry to head home. Ben and Jon sat on the couch, and Chris and Rob started getting another plate of food. Matt was considering the best way to bring up the bet. “So, Matt, let’s talk about this bet,” Ben started the discussion. “It could be a fun, crazy time,” Matt smiled. “Who’s fronting the money?” asked Chris. “I was thinking we could all put in a thousand dollars. The winners would get their money back, plus they would split the loser’s money,” Matt explained. “This might be a good idea. It might be fun to try dating a normal girl who doesn’t know I’m rich, and not be after my money,” Jon chimed in. “I thought you were against this,” commented Rob. “I was initially, but I was thinking about it during the game. I was watching the crowd, especially the guys and girls who were on dates. I want to try and date a girl who doesn’t come from money. I was born into a family that has been rich for generations. I want something different. I want to mix it up a little,” admitted Jon. “I wouldn’t mind doing this because I love challenges,” Ben responded. “This is crazy. I’m out,” Rob said. “I’ll do, it because I’m not going to be left out. But, I don’t want to do this for a year. How about six months?” suggested Chris. “How about a compromise and do it for nine months?” Matt offered. “You need to make sure everyone’s playing by the same rules,” Rob recommended. “What rules would we need?” asked Chris. “Everyone playing would have to live off the paycheck of the job they get. They can’t use your own money, stock options, trust money or interest. Also, our families can know where we are but they don’t need to know about this bet. Actually, no one should know about this bet but us,” Matt was the first to respond. “You guys need to be checked on?” Rob said, very logocially. “Who’d check on us?” Ben asked. “I think we should all live together. Then we can see what’s going on with each other,” proposed Matt. “Since you’re not playing this game, Rob, I think you should be the judge. You can check our bank accounts to make sure we’re not using our money. You can come see us once a month. You can check out our homes and see where we work,” submitted Jon. “So, you’re trying to drag me into this game by being the judge?” Rob laughed. “Ok, I’ll be the judge,” Rob laughed harder. “So, who’s all in?” Matt asked. “I want to date a special girl. So, I’m in,” admitted Jon. “I’m following the crowd on this one,” stated Chris. “I’m obviously in, because I came up with the idea. Is everyone good with nine months?” proposed Matt. All agreed to the money and the nine months. “Where are we going to live?” questioned Ben. Matt noticed that in the suite, near the black leather couch, was a map of the United States. He walked over to it, closed his eyes, turned around two times, and then touched the picture. All the guys gathered around as he shouted, “Las Vegas.” The guys were high fiving and very excited to be living in Vegas. “I can head to Vegas and get us a place to live. How long will it take you to get things settled here so you can move?” Matt asked, relieved to have the guys with him on his journey. “I’m sure the board of my father’s company will let me have some time off, if I explain that I’m looking for some real estate findings in Vegas,” Ben explained. “I’ll have to do some Skype calls for some of the board meetings, but I think they’d be fine with me leaving. My dad really runs the chemical company. My main role is advising on the board, so I can still do that in Vegas,” Jon admitted. “I’ll tell my dad that Ben and I are working on a resort idea in Vegas. It shouldn’t be a problem,” Chris commented. “Okay, I’ll head to Vegas in the next few days and find us a place to live. I’ll put down the deposit and pay the first month. You’ll have to pay me back when you move in,” directed Matt. He realized that he had to take care of this money and not be careless. Ben wondered what he’d gotten himself into.